Interested in booking me for a masterclass, workshop, or lecture? From pointe shoes to acro to hoverboards. I’m Hilary. I don’t play flute like a normal person. 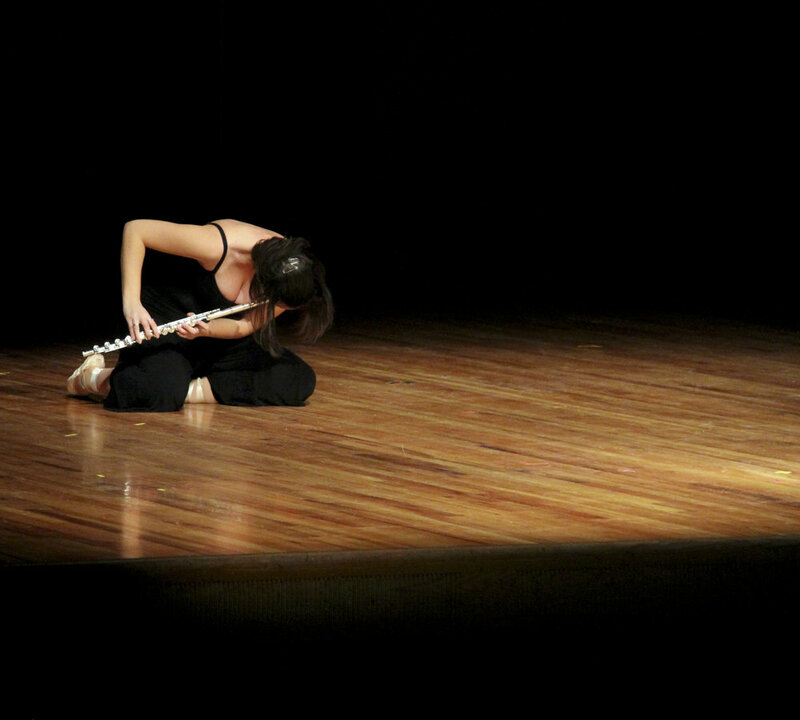 Hilary Abigana is a founding member and flutist for the hybrid arts ensemble, The Fourth Wall. Praised by The Wall Street Journal for their “deft choreography,” The Fourth Wall explores a new hybrid of the performing arts in which musicians are also dancers and actors. Stretching the boundaries of instrumental performance, The Fourth Wall commissions new interdisciplinary works and reinterprets established repertoire to make music that leaps off the stage. Most recently, they made their Off-Broadway debut at the SoHo Playhouse after completing a three-month long tour along the fringe festival circuit in North America with their multi-award winning neo-vaudeville variety show, Fruit Flies Like a Banana. In addition to performing hybrid arts shows, The Fourth Wall travels all over the continent conducting workshops in the basics of this genre, and encouraging participants to utilize music, dance and theater techniques in their performances. Their presenting series, The Fourth Wall Presents…, is a monthly performances series in the Greater Boston area that showcases artists from around the country alongside the trio’s own antics. Passionate about teaching, Hilary was the Guest Artist at Floot Fire Dallas, choreographing over 100 young flutists in a performance of “I’ve Got Rhythm.” She then joined the Floot Fire faculty, was on faculty at the International Flute Symposium (with The Fourth Wall), and was co-director and Irish Flute teacher at the Irish Arts Academy of Indianapolis. Hilary is at home in the orchestra as well as in front of it. She has performed with the Buffalo Philharmonic and Saint Paul Chamber Orchestras with the “music-telling” ensemble, Tales & Scales; with the Evansville Philharmonic in a performance of the Brandenburg Concerto No. 4; and premiered a new family show in November 2013 with The Fourth Wall and the Capitol City Symphony. She was the second flutist for the Evansville Philharmonic Orchestra and piccolo player of the Owensboro Symphony Orchestra. Hilary received her Bachelor of Music degree with Distinction and was awarded the Performer’s Certificate from The Eastman School of Music and she received her Masters Degree from Rice University’s Shepherd School of Music. Hilary is a proud Verne Q. Powell Flutes Artist. Photos from the 2016 Minnesota Fringe, 2017 Orlando Fringe, Viscous & Tingle Present Mount Olympus, and the 2018 Orlando Fringe. Please send me a message to get in touch!